A pop up stall by Caitlynn Neil Pet Photography will be capturing gorgeous portraits of your best buddy set in the picturesque grounds of Newbattle Abbey College with all proceeds to PDSA Edinburgh. Pop up stall by Caitlynn Neil Pet Photography who will be capturing gorgeous portraits of your best buddy set in the picturesque grounds of Newbattle Abbey College. For a £15 minimum donation you will receive two digital portraits which will be emailed to you. There will also be a collection bucket for any spare change you may wish to donate. All proceeds will be helping to raise vital funds to allow the dedicated hard working team at PDSA Edinburgh to continue saving pets lives. Caitlynn works as a veterinary nurse there and it would mean such a lot to give your support to a charity close to her heart. All dogs are welcome! Come along on the day and photos will be taken on a first come, first served basis. Don’t forget to bring your dogs favourite treat or toy to help capture their best pose! 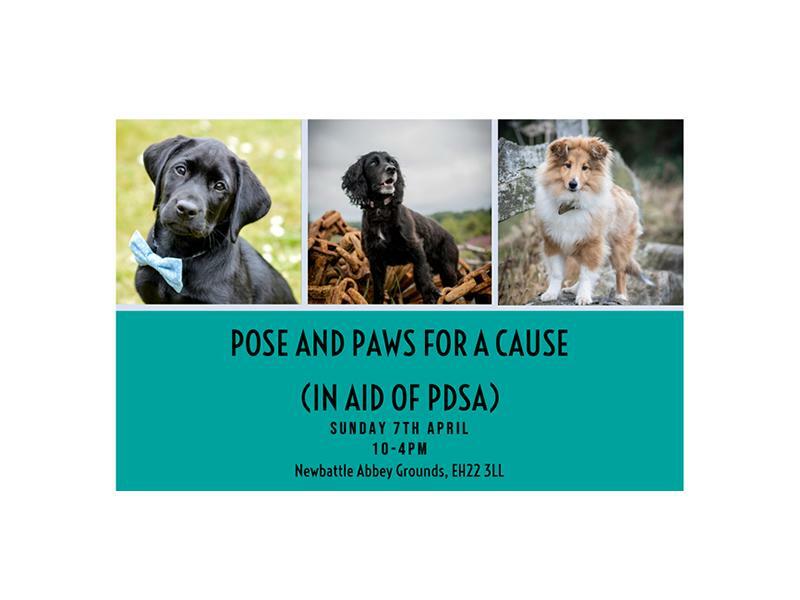 While we take every opportunity to ensure the details for Pose and Paws for a Cause: In Aid of PDSA Edinburgh are accurate, we always advise that you contact the event organiser before setting out for the event to avoid disapointment. Come and have a bark in the park with your four-legged friend at Dog Jog Edinburgh on Sunday 28th July! After the amazing success of our Big Animal Pub Quiz 2018, Edinburgh Dog and Cat Home are bringing you an even bigger event this year! Come along to our fundraising Ceilidh on Saturday 27th April with the brilliant Science Ceilidh Band as well as interval act - Claire Hastings & Robyn Stapleton! Grup Ternari are coming over to Edinburgh from Spain on Sunday 28th April at what promises to be a unique concert in Craigmillar Park Church! All aboard for some terrifically terrifying tales, some tall, some true, some to make your timbers shiver… be warned, there may be dragons! Join us in Fort Douglas as we screen The Greatest Showman, everyone's favourite modern classic, with quite possibly one of the catchiest soundtracks ever written! Restoration Yard is excited to welcome Children’s Publisher 'Beyond The Moon' for a book reading of their new book ‘The Sock Monster', followed by a joint craft workshop, over the Easter weekend. Bring your camera to Holyrood Park and the Bawsinch nature reserve and learn how to get the best shot from a local wildlife photographer.